The Liber Malorum – the book of life and death – created by heretic monks long ago to raise the dead and to demonize the living. This ancient text, believed to have vanished in 1947 in Soviet Russia, has now reappeared in Genoa, Italy and a man calling himself Doctor Angelo Montorio desperately wants to get his hands on it. To assist him, Montorio hires Kyle Rush, a professional thief specialising in obtaining unusual items and relics relating to the occult. When the deal between the two men turns sour following a heist to steal the book, Rush's partner and lover is killed, while Montorio manages to escape with the prize leaving Rush with a score to settle. A bizarre twist of fate sees him teaming up with Matthias Locke, a former covert operator-turned-Buddhist monk with a troubled past. The Liber Malorum unexpectedly ends up first in Locke's possession and then that of an innocent woman who harnesses the book's power and turns into a demonic killing machine. All hell breaks loose as she goes on a horrific rampage, bringing the dead back to life and destroying all who dare challenge her. Now it's up to Rush and Locke to face the ultimate evil and destroy it before it's too late. Written and directed by independent filmmaker William Lee (Dark Target; Code Black) and described by Indie Express as "a film that defies explanation; quite possibly the first ever action-adventure, horror, martial arts, crime drama, cult, vigilante, gangsta flick ever made," Demons Rising stars E.J. Toxey (Out of Nowhere), Sylvester Person (Code Black) and Rebecca Moore (Dark Target). 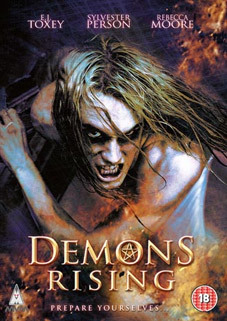 Demons Rising will be released on UK DVD on 6th June 2011 by MVM at the RRP of £9.99.